Winter is basically here and with this season comes more time spent indoors under blankets watching movies or series. For a lot of us, this is heaven but there are also a select few who still enjoy entertaining outside, especially when craving a good old barbeque. Whilst the cold might keep many people indoors even those who don’t particularly like the winter weather can now rest assured that there are heaters that can heat up a very large area. So you can still entertain and not freeze at the same time. Thanks to the forward thinkers of today we don’t have to spend the entire winter indoors. When looking into having an outdoor heating system installed you should choose someone who knows what they’re doing, and who knows the products. Hawkesbury Heating in Sydney has been in the business for 35 years, so there’s no doubt that they’d be best suited for such a job. Don’t be frightened by the name, because the look of it is simplistic and modern. It’s available in both Stainless Steel or Sunset Bronze UV rated powder coated top. It comes with a choice between vibrant crystals, volcanic stones or driftwood ceramic logs, so it will suit your outdoor space, no matter what the design and décor. The Regency Plateau Coffee Table is another outdoor beauty that can be switched on with the flick of a switch. Your entire family and all your friends can gather around for a fun evening and not be bothered by the winter chill. It is larger than the Regency Plateau Outdoor Gas Fire Coffee Table so will be suited for a larger outdoor space, it just depends on your needs. This model is pretty spectacular because you and your guests can gather around it for drinks and appetizers, enjoying the fresh air and warmth at the same time. It’s perfect for patios and decks and will be perfect for a home overlooking a lake or the ocean. This Regency model is different from the other because it is a fireplace and was designed to be used outdoors. It delivers wide-angle flames and comes with a choice of ceramic garden stones, reflective crystals or logs. It uses natural gas or propane, comes with a seasonal weather cover and doesn’t need any venting. It looks beautiful as well and will finish off any outside area perfectly. Lopi fireplaces are another powerhouse to mention here and the Lopi Endeavour Freestanding Wood Fireplace is an incredible example. 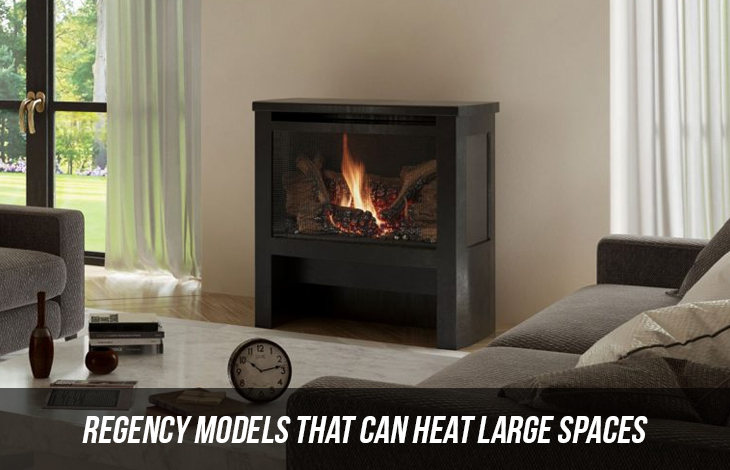 It can heat up to 250sqm and is freestanding, so it can be used inside or outside. Available with either shadowbox or cypress fascia. Not only does it heat up an area but it can also be used to cook. So you don’t have to miss all the fun and excitement by running back and forth from the kitchen. This fireplace is a modern powerhouse because it creates more heat from less wood because of Hybrid-Fyre Technology. It can heat an area of 300sqm and can burn up to 12 hours.It’s available with either shadowbox or cypress fascia and is perfect for the family who enjoys green living.